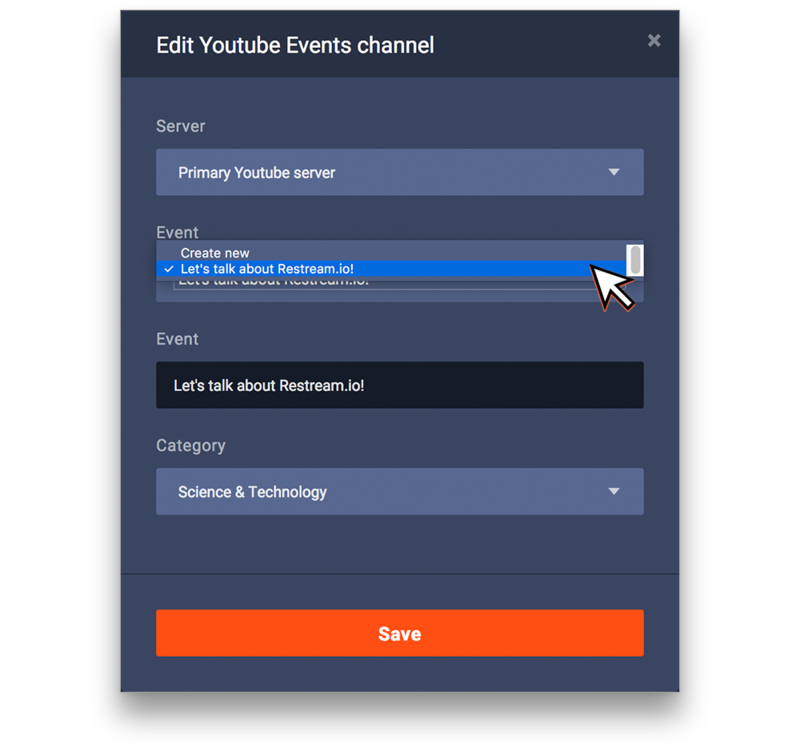 How to setup YouTube Events with Restream! 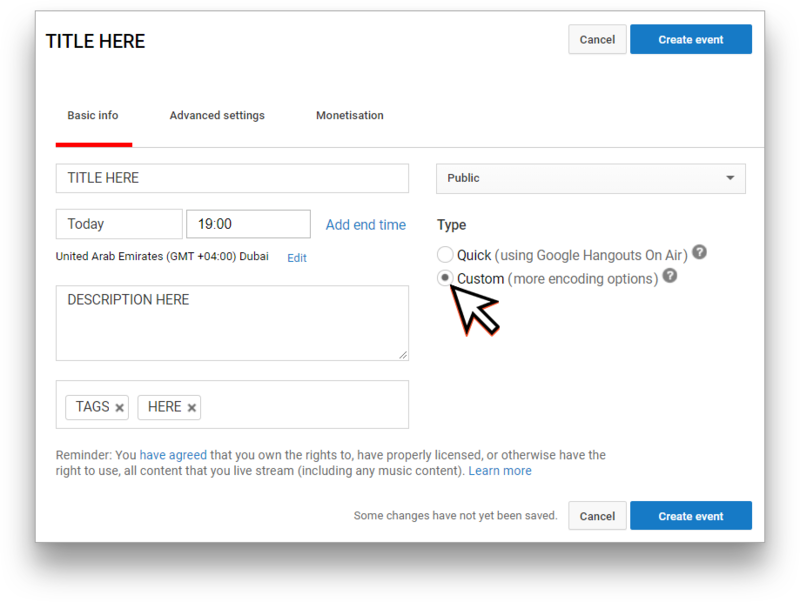 YouTube Events is a great way to share videos with your audience. 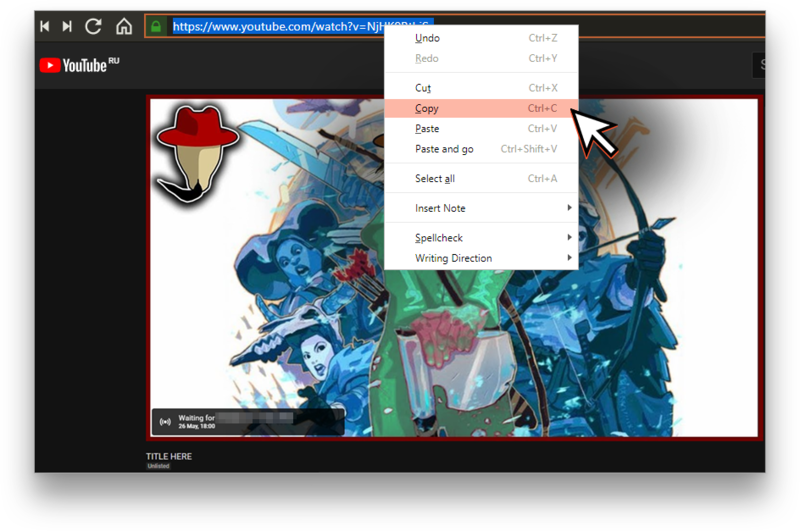 It gives you a great control over your stream, and allows you to notify your users about the stream before it starts. 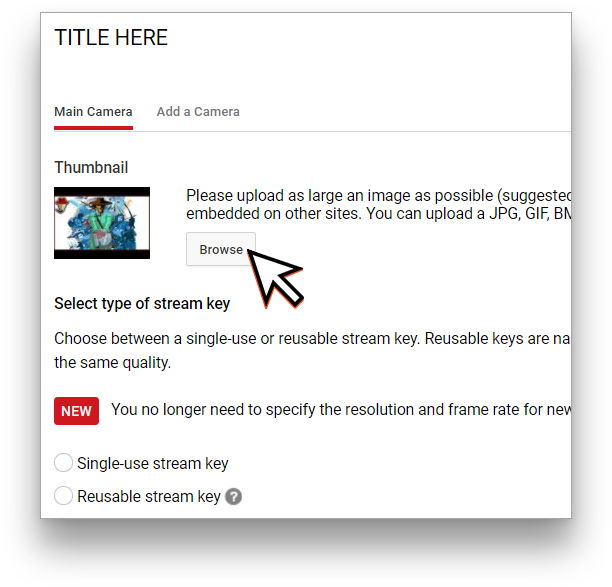 YouTube can also accept streams with great bitrates - you can read about YouTube possibilities and recommended streaming parameters at this page. 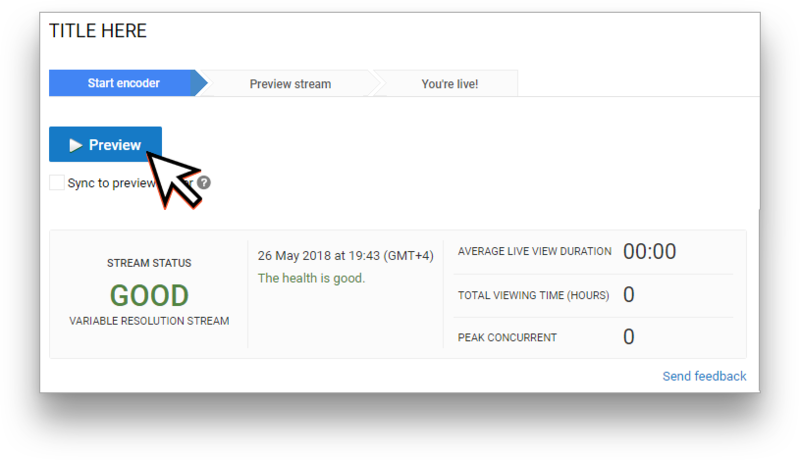 Automatic is the simplest way of connection and it is similar to YouTube Stream Now - it starts streaming after you connect to Restream. Manual can be used for more precise control of the stream, or if the automatic system does not work for your channel. 3. Click “YouTube Events” from the Channel List. 4. 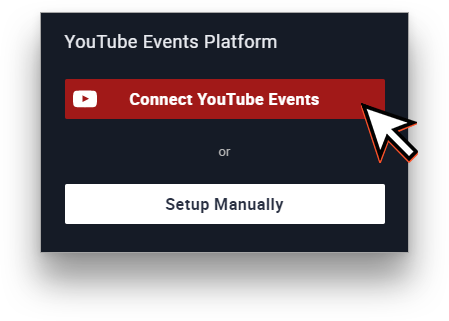 Choose “Connect YouTube Events” from the Info Page. 5. 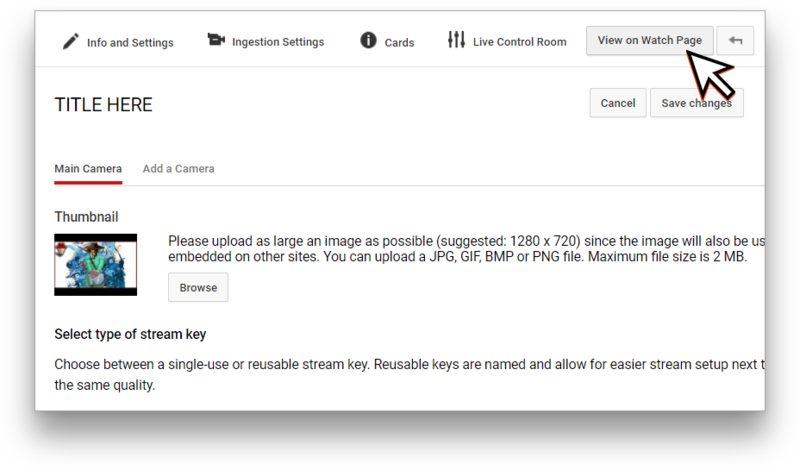 Select your YouTube account from the Auth Page. 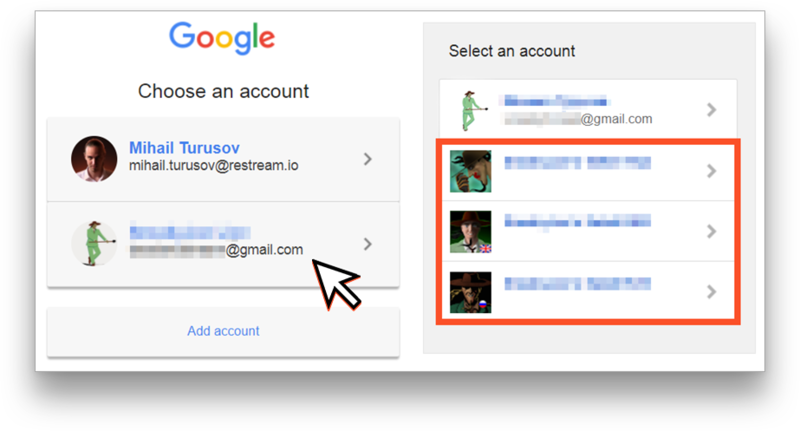 Important: You need to choose your Gmail account with your YouTube channels connected to it if there are multiple Gmail accounts logged in. 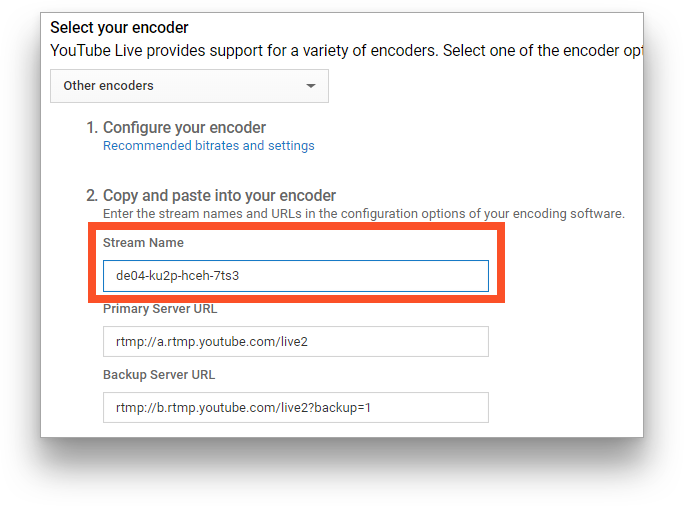 Then you need to select the correct YouTube account to stream to. There will be an error if you will select the wrong account and you'll need to start over. 6. 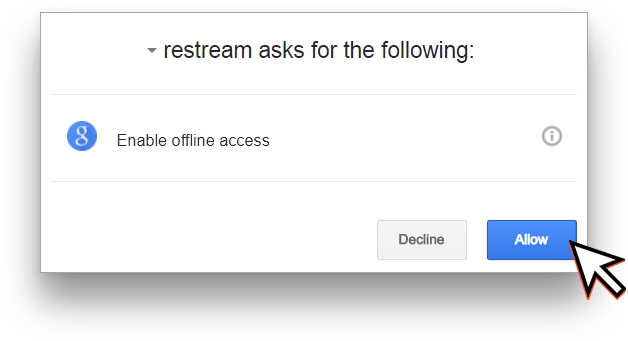 Click “Allow” from the YouTube Events Auth Page. 7. Give your next event a title, and select the category that best fits your stream. 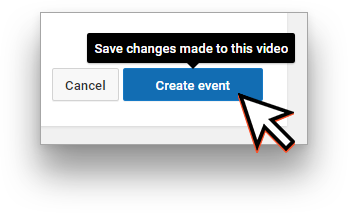 If you have already scheduled an event through YouTube or by following our Advanced steps bellow, you can select it using the "Event" drop-down. 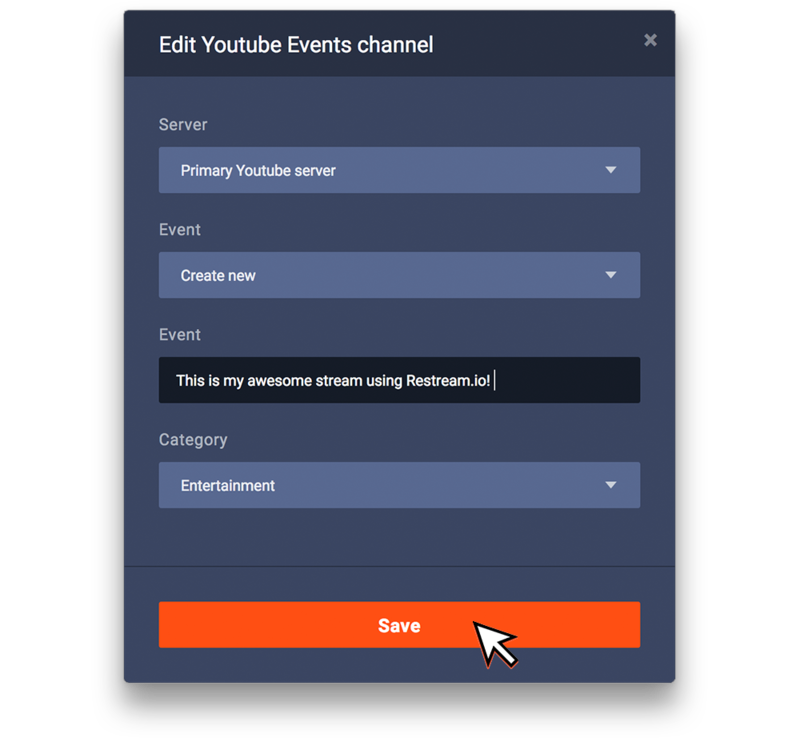 Then click "Save"
You are now ready to stream to YouTube Events using Restream! Note: If you would like more precise control of your event, like: Air time, description, tags and URL. Please scroll down to the Advanced steps below. 1. 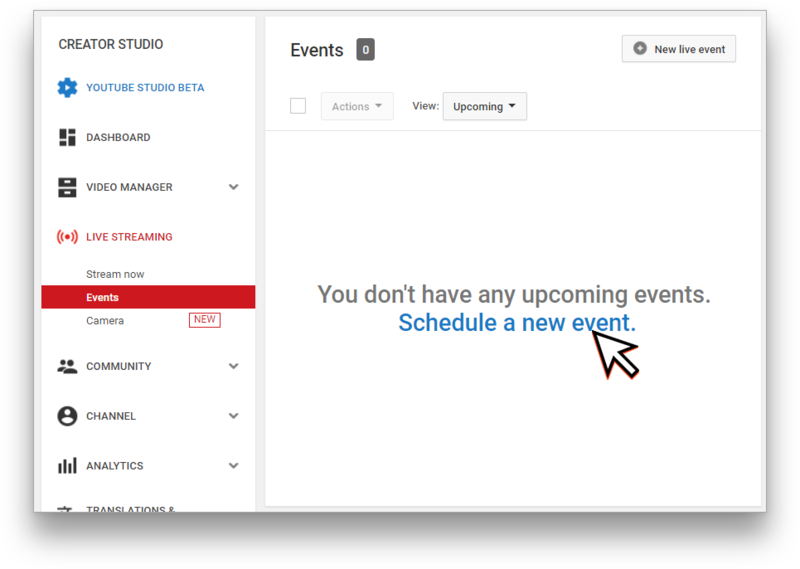 Head over to your Events Dashboard and select "Schedule New Event"
4. Choose a thumbnail for your stream. 5. Select the type of key you want to use. 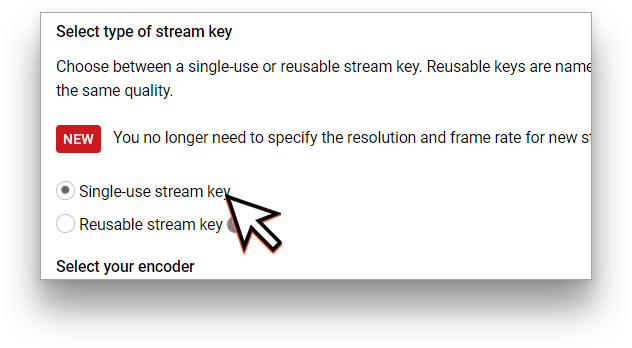 We recommend "Single-Use Stream Key." 8. 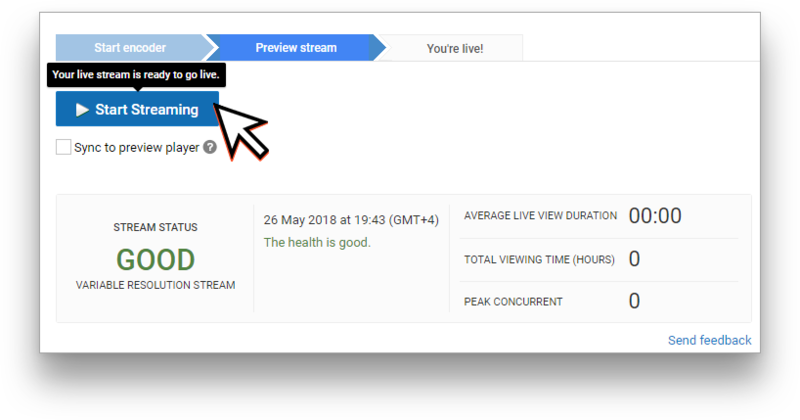 You can now select your event during YouTube Events setup, or editing your YouTube Events settings from your Restream Dashboard. 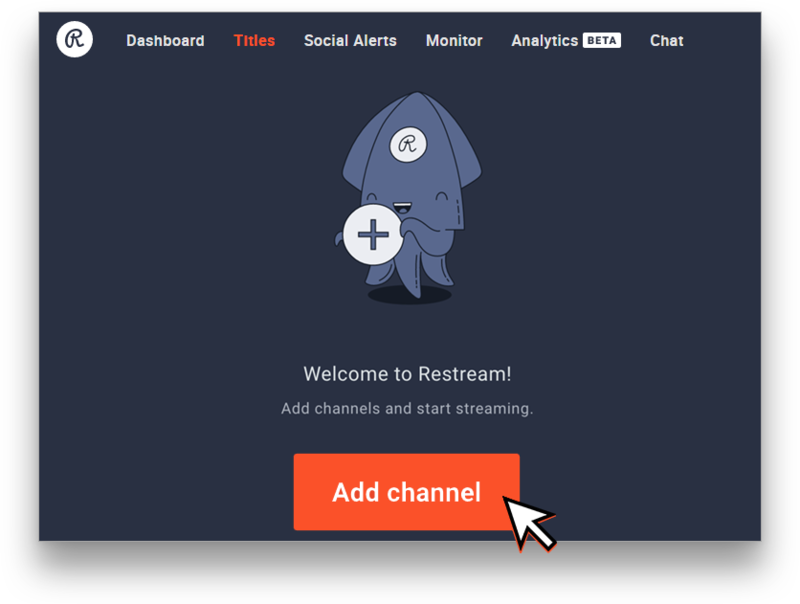 You are now ready to stream to your custom YouTube Event using Restream! 3. 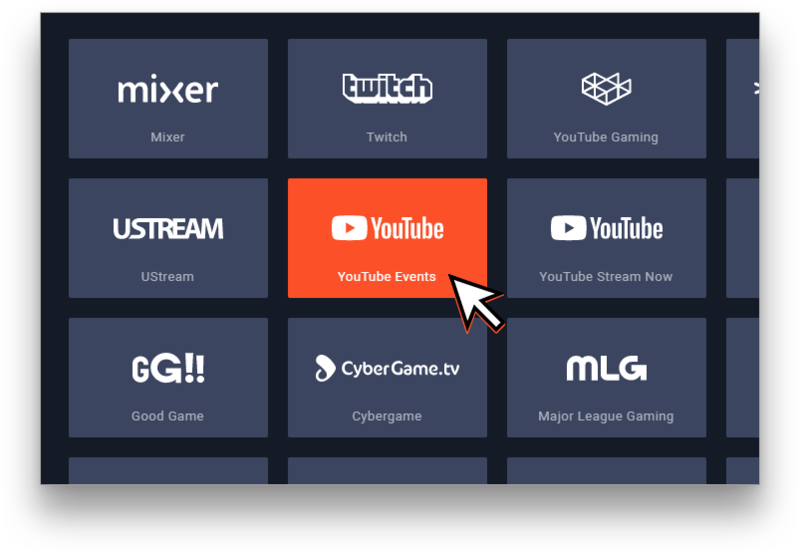 Choose “YouTube Events” from the Channel Listing. 5. Head over to your Events Dashboard and select "Schedule New Event"
13. Head back to YouTube and choose "View on Watch Page"
15. 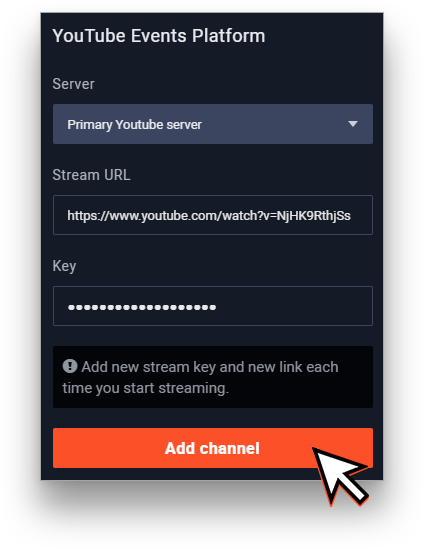 Paste the URL into Restream's "Stream URL" and choose "Add Channel"
Youtube Events is now connected to the Restream Dashboard! 16. 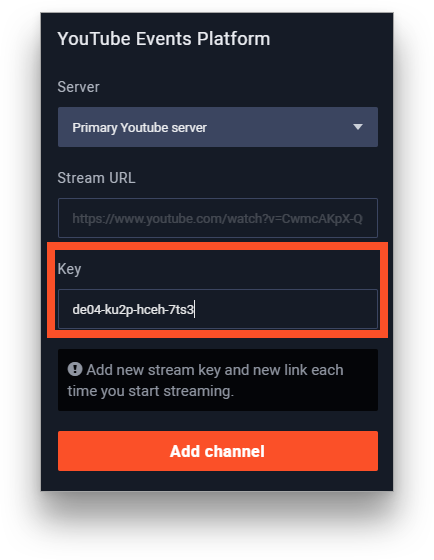 You now can start your stream to Restream.io. 18. Start previewing your stream. 19. When the event time comes, press the "Start Streaming" button. 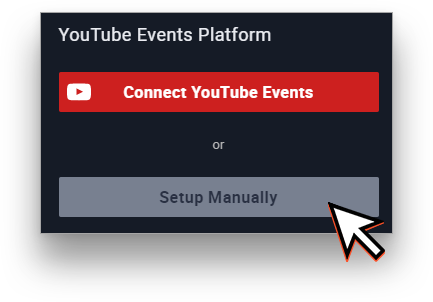 You're now live on YouTube Events with manual connection with full control over your stream!